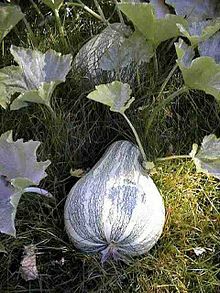 Cucurbita argyrosperma, also the Japanese pie pumpkin or cushaw pumpkin, and silver-seed gourd, is a species of winter squash originally from the south of Mexico. This annual herbaceous plant is cultivated in the Americas for its nutritional value: its flowers, shoots, and fruits are all harvested, but it is cultivated most of all for its seeds, which are used for sauces. It was formerly known as Cucurbita mixta. It is a Cucurbita species, with pumpkin varieties that are commonly cultivated in the United States as part of the Eastern Agricultural Complex and Mexico south to Nicaragua. Of all the cultivated Cucurbita species it is the least found outside the Americas. It originated in Mesoamerica and its wild ancestor is Cucurbita sororia. It is also closely related to Cucurbita kellyana and Cucurbita palmeri. The flowers are orange or yellow and bloom in July or August. The plant grows about 1 foot high and spreads 10–15 feet. It likes well drained soil and has both male and female flowers. Fruits can weigh up to 20 pounds. It is often found in close proximity to Cucurbita moschata. The flowers, stems, shoots, and unripe fruits of the plant are consumed as vegetables. In the south of Mexico, the wild, more bitter varieties are used in this same way, once washed and cleaned to eliminate cucurbitin. The ripe fruit is grilled to make pies or used to feed animals. The seeds yield an edible oil. It is also grown in the Sonoran Desert region of the Southwestern United States and Northwestern Mexico by native peoples, especially the Tohono O'odham, where it is especially prized when immature as a summer squash. The Yucatán peasantry has traditionally used the flesh of Cucurbita argyrosperma to tend burns, sores, and eczema, while the seeds have been used with the aim of promoting lactation in nursing women, and provide pain relief. ^ a b c "Cucurbita argyrosperma". Germplasm Resources Information Network (GRIN). Agricultural Research Service (ARS), United States Department of Agriculture (USDA). Retrieved January 3, 2015. ^ Sanjur, Oris I.; Piperno, Dolores R.; Andres, Thomas C.; Wessel-Beaver, Linda (2002). "Phylogenetic Relationships among Domesticated and Wild Species of Cucurbita (Cucurbitaceae) Inferred from a Mitochondrial Gene: Implications for Crop Plant Evolution and Areas of Origin" (PDF). Proceedings of the National Academy of Sciences of the United States of America. Washington, DC: National Academy of Sciences. 99 (1): 535–540. Bibcode:2002PNAS...99..535S. doi:10.1073/pnas.012577299. JSTOR 3057572. PMC 117595. PMID 11782554. ^ a b "Cucurbita argyrosperma". Missouri Botanical Garden. Retrieved September 15, 2013. ^ a b c Nee, Michael (1990). "The Domestication of Cucurbita (Cucurbitaceae)". Economic Botany. New York: New York Botanical Gardens Press. 44 (3, Supplement: New Perspectives on the Origin and Evolution of New World Domesticated Plants): 56–68. JSTOR 4255271. ^ Merrick, Laura C. "Characterization of Cucurbita argyrosperma, a Potential New Crop for Seed and Fruit Production". HortScience. American Society for Horticultural Science. 25 (9): 1141. ^ Fritz, Gayle J. (1994). "Precolumbian Cucurbita argyrosperma ssp. argyrosperma (Cucurbitaceae) in the Eastern Woodlands of North America". Economic Botany. New York Botanical Garden Press. 48 (3): 280–292. doi:10.1007/bf02862329. JSTOR 4255642. ^ a b Saade, R. Lira; Hernández, S. Montes. "Cucurbits". Purdue Horticulture. Retrieved September 2, 2013. ^ Wessel-Beaver, Linda. "Cucurbita argyrosperma Sets Fruit in Fields Where Cucurbita moschata is the only Pollen Source" (PDF). University of Puerto Rico-Mayaguez. Retrieved September 15, 2013. ^ a b c "Cucurbita argyrosperma - C.Huber". Plants for a Future. Retrieved September 14, 2013. This Cucurbitales article is a stub. You can help Wikipedia by expanding it. This page was last edited on 6 October 2018, at 17:20 (UTC).